Keep your Office / Home Secure with Web Secure. Configure rules to block and allow websites. Allow only work related sites and blocks all other sites or Allows all other sites or Allows all sites and block certain unwanted sites. Administrator Password to configure the rules and also for uninstallation of the software. Software is very easy to install and use but yet it provides very powerful security. 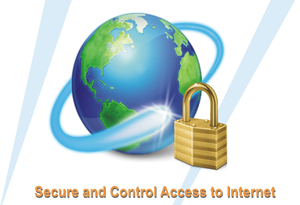 Control which applications can use the internet like Web browser, chat software, email clients etc. Block out unwanted upload and download by viruses / worms in the background. Automatically secures all major web browsers. Uses advanced technology. Complete report of which site was visited, when and with the name of the application used. * All Taxes and installation charges Extra.